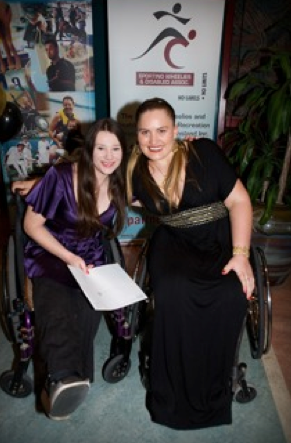 Susan is a 22-year-old University student who competes in para- equestrian (dressage) events and dreams of representing Australia at the Paralympics. She was born with Arthrogryposis Multiplex, a rare disorder characterised by fusion of joints and absent muscle formation her legs. She began her sporting career as a swimmer at the age of four, when she was taught to swim as physiotherapy. She went on to hold six Queensland State Games Records and three Australia National Age Records in freestyle and backstroke. But Susan’s true love is horses. She started riding lessons when she was seven at the McIntyre Centre. She represented Queensland for the first time at the National Riding for Disabled (RDA) Dressage Championships in 1998 and placed 1st in her warm- up test against international riders. Since then she has competed at National level as part of the state team for nine consecutive years. While learning to ride, susan competed on more than 60 different horses while longing for a horse of her own. Susan now has her own horse, an 11-year-old Morab (Morgan/ part-bred Arab) paint gelding named ‘Menora Wildfire’. He was originally used for endurance riding but was kindly donated to Susan Susan by Morgan and Morab Stud in Victoria. Equestrian Centre in Langley, Canada. This feat is even more remarkable when you consider that she was riding a borrowed horse because her own horse was in Australia, and she had only days to practice on her borrowed mount. Susan was one of 12 Australian riders short listed for the 2008 Beijing Paralympics and competed at the team selection trials, but missed out on a place in the team. However, Susan had overcome remarkable odds to even be at the trials. The equine influenza outbreak prevented her from travelling to the trials with Menora Wildfire. She had to compete on a borrowed horse, with just two days practice. Susan displayed her indomitable spirit when faced with the challenge of equine influenza outbreak. 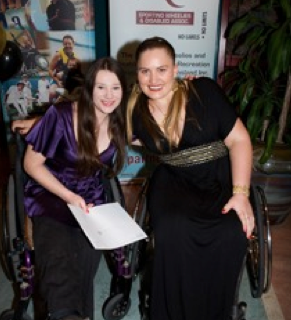 While unable to ride her horse from August 2007-february 2008, she took up a new sport-adaptive rowing- and went on to win 2 gold medals at the Queensland rowing state championships. She qualified for the national championships, however was unable to compete as the event clashed with the para-equestrian Paralympics trials. When she is not riding Susan enjoys other sports such as swimming, rowing, sit-skiing, wheelchair tennis, archery, and canoeing with the Sporting Wheelies and Disabled Association of Queensland. Susan is also a keen scholar, completing her senior certificate in 2003, Information Technology certificates I and II in 2003, and a TAFE course in Horse Management in 2004. She is currently studying a Diploma of Applied Science, Equine Studies Major at the University of Queensland. Her aims for the future are to represent Australia at International competitions, the FEI World Equestrian Games, and the Paralympic Games.